A few weeks ago the upcoming memoir Tables in the Wilderness by Preston Yancey arrived on my doorstep. I started to casually read it. He’s a twenty-something writer who likes to cook and hang out with icons. I didn’t quite know what to expect. While I haven’t finished it yet, I’ve been completely delighted by his story and his masterful writing, and I highly recommend preordering it today. Preston is also a passionate blogger who has kindly shared his blog, hosting me for a guest post adapting A Christian Survival Guide’s chapter about prayer. Did you know that Jesus spent significant amounts of time praying? He regularly took trips into the wilderness and up mountains to pray for extended periods of time. It’s not exactly a hidden aspect of his ministry. It’s just one that I didn’t think about too much until recently. Have you ever wondered why Jesus prayed so often? Wasn’t Jesus already pretty tight with God since he was a member of the Trinity? The fact that he took time to pray is a Trinitarian brain bender. Wasn’t he still God? 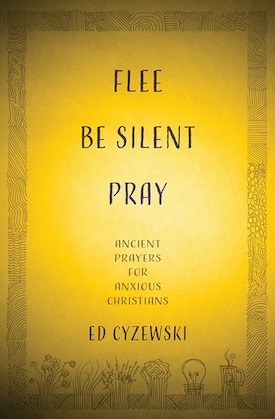 If Jesus made prayer an integral part of his life, what makes us think we can do any better without it? If anything, Jesus sent us a very important message about the practice and importance of prayer. Our survival as followers of Jesus depends on it. If our Lord modeled prayer for us, then we’d better figure out a place for it in our lives. Many Christians I know today, myself included, struggle with a condition I call “prayer guilt.” We all like to pray. We all see the value of prayer. We even pray most days. However, we always feel like we never pray enough. If we have prayed, we didn’t pray long enough or failed to stay focused while praying. I’ll even tell myself, “Sure I prayed, but the prayers weren’t very good.” It would be nice to at least have a vision or speak in a tongue or two before checking prayer off my “to do” list. I’ve spent far too many days living with an underlying sense that I should be praying more or doing more for God. I can always think of someone who must be meditating longer, reciting prayers that are more ancient, or lighting taller, brighter candles. Whether or not I’m correct, that guilt leaves me feeling inadequate and unable to approach God with the kind of confidence that Jesus talks about. Read the rest at Preston’s blog.